Retired US Marine Corps General John Kelly, nominated to head the Department of Homeland Security under President-elect Donald Trump, testifies before the Senate. Kelly, 66, previously headed the US Southern Command and served as adviser to former Pentagon chiefs Leon Panetta and Robert Gates. He retired from the Marines in January 2016. Established in response to the September 11, 2001 terrorist attacks, the Department of Homeland Security has around 250,000 employees and a budget of $40 billion, encompassing agencies ranging from the US Secret Service and the Coast Guard to FEMA and airport security (TSA). After being sworn in, Kelly thanked the Senate for the kind reception. Answering a question from McCain about opioids and heroin, Kelly said that "100 percent of heroin we consume in US is in fact produced in Mexico" and that part of the drug problem is that the US is a "heavily medicated society." “A physical barrier in and of itself won’t do the job,” Kelly said about the border wall proposed by Trump. It would still have to be backed by patrols. Defense of the southwestern US border begins as far south as Peru, he explained, by partnering with South American countries to interdict drug manufacturing and trafficking. “With high confidence,” was Kelly's three-word reply. Immigrants from Latin America come to the US for three reasons, he told McCaskill – to escape violence, to seek economic opportunity, and because they are confident they won’t be sent back. “I hold the people to our south in very high regard,” Kelly said, remind the Senate that he headed the US combat command in charge of South America for years. 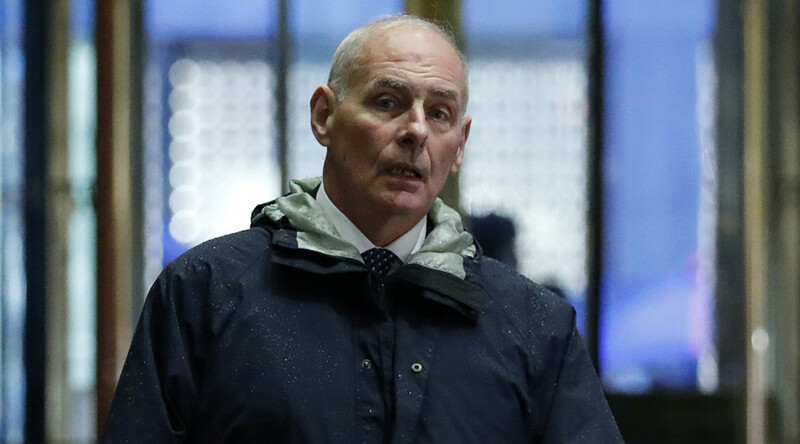 Answering Senator Rob Portman (R-Ohio), Kelly said he would encourage better integration within the DHS, citing the example of reforms within the military that brought the branches together despite the generals who griped about it. “Yes, the Marines are still the best, but the other services are pretty good too,” Kelly said. He told Senator Jon Tester (D-Montana) he would look into better tracking of people coming into the US. “We don’t have a very good system” to notify law enforcement when visitors’ visas expire, Kelly said. Senator Ted Gaines (R-California) asked about the future of cyber-security, and Kelly said the government should work more with the private sector to find solutions. “At this point everyone realized it’s in everyone’s interest… that working together makes an awful lot of sense,” he said, noting that there are privacy issues and legal obstacles that will need to be taken into consideration. “We’re not appreciated and we’re not allowed to do our jobs,” was the primary complaint that Kelly has heard from DHS employees, and he said he would set out to change that. Senator Gary Peters (D-Michigan) asked about the Trump proposals for general surveillance of mosques and establishing a Muslim registry, asking Kelly if they would pose constitutional issues. Peters also brought up the Supreme Court case about the WWII Japanese internment. Newly sworn-in Senator Kamala Harris (D-California), pressed Kelly on whether the DHS would use the information from immigration forms submitted by DACA applicants in cases against them. “There’s a big spectrum of people who need to be dealt with in terms of deportation,” Kelly replied, adding, “I would guess this category would not be the highest category in terms of removal.” He promised Harris he would "keep a very open mind" about this policy. “I’ll follow the law,” Kelly told Harris, noting that the government has a “limited capacity” to execute the immigration laws. Senator Rand Paul (R-Kentucky) asked Gen. Kelly about his views on indefinite detention, the federal and military authority to hold US citizens indefinitely without a trial under suspicion of terrorism or association with terrorists. "I am pretty committed to the Constitution," Gen. Kelly said, adding that he was "not aware of the law" that Sen. Paul referenced, which President Barack Obama reluctantly signed into law as part of the National Defense Authorization Act of 2012. "It surprises me," Gen. Kelly said. "I think we have enough laws to help us out in that department." Sen. Paul then turned to mass surveillance and bulk data collection on all Americans, asking whether Gen. Kelly would favor such programs or the "proper process" outlined by the Constitution. "I'm not for the mass collection of data on people," Gen. Kelly said. "I'd go the other way."